Power of Attorney - To Sign or Not? 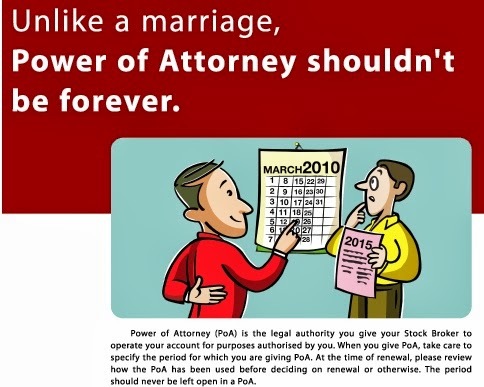 A trader may be required to sign a power of attorney with their broker to allow him to transfer the stocks on their behalf or as a matter of fact it can be for any aspect for which you are authorising him to undertake the action and this is generally given in fine print which none reads while opening a demat account. However one must take care of the following guidelines to have a safe and hassle free dealing with having executed a power of attorney. Remember that one should not leave the power of attorney open ended and one still has the power to revoke the same by giving a reasonable notice. Check out whether it is required to enter in a Power of Attorney in Real Estate Deals or not as aim is to have safe and secure transactions which your hard earned money deserves. Rather it is advisable to sign letter of authority in lieu of power of attorney to have a peace of mind.